Hidden New Jersey: A grocery store in your house? How convenient! A grocery store in your house? How convenient! 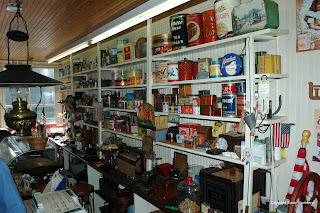 Hillside's Woodruff House/Eaton Store Museum crams a lot of history into a very small space. Nestled into a pleasant neighborhood on Conant Street, the original house was built in 1735, with additions built in 1790 and into the 19th century. Typical of most colonial house museums, the house contains a mix of artifacts representative of life during the 1700s and early 1800s. There's also a sizeable, more 'modern' kitchen constructed in the late 1800s. More than anything else, the house is a great way to show young people and other local residents what life for the average family was like when the region was still largely agricultural. The real treat of a visit to the house is what's attached: a complete neighborhood grocery store. I've been to a lot of house museums, and I can't recall ever seeing one that had a retail establishment appended to it. You hear about families that own stores and live above or behind them, but it's a bit less typical to add a store to an existing house. Not surprisingly, the Eaton store originated as a bit of an afterthought. The Woodruff family had already built and moved into a house next door when Theresa Woodruff realized that it would be convenient to have a place to sell the fruit from the family's orchards nearby. Using wood left over from construction of their new house, the family built the store onto the end of their then-vacant house. Eventually, as Theresa found the store took too much of her time, she rented it to a series of merchants, ending with Gilbert Eaton, who'd been doing business out of his horse-drawn cart. His wife Sarah operated the store while he continued his mobile business, and under her management, the location grew into a true general store and a community center of sorts. While making their purchases, local residents would discuss local events and politics, including the secession of Hillside from neighboring Union. Many counted on the Eatons for telephone service, as well, since they were among the few who'd had a phone installed. Visitors today may not be able to make purchases, but they can get a good sense of what it was like to shop there. 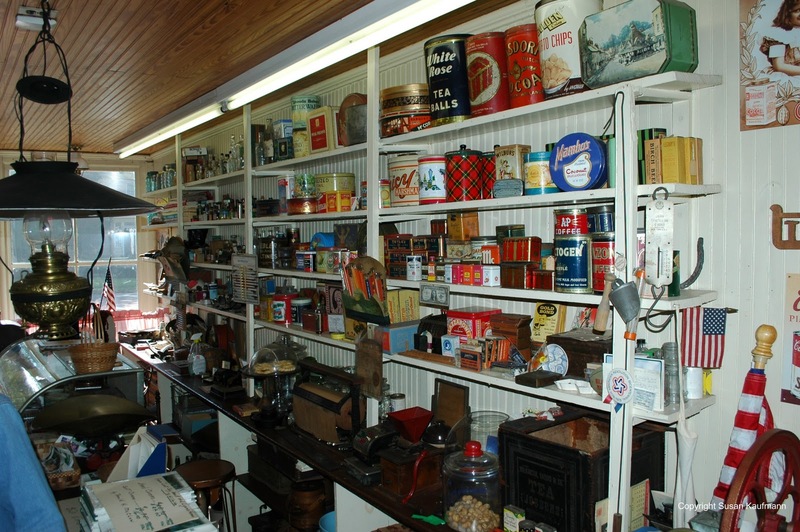 An Eaton family member contributed many of the vintage grocery items on the store's shelves and helped to guide the overall restoration. You'll see many familiar brands represented, only in different incarnations, plus a host of local memorabilia. To my knowledge, there's no other museum quite like this in Union County. In many ways, the Eaton store is a distant forebear of the bodegas and corner stores you might see in a large city. The inventory represents a little of everything, and the place tends to be a gathering point for the neighborhood. So where did you say those warheads were?